any anemia in which there is a predominant number of megaloblastic erythroblasts, and relatively few normoblasts, among the hyperplastic erythroid cells in the bone marrow (as in pernicious anemia). a hematologic disorder characterized by the production of macrocytes in folate and vitamin B12 deficiency. See also nutritional anemia, pernicious anemia. Pernicious anemia Hematology A type of anemia characterized by enlarged RBCs, ↓ WBCs, ↓ platelets Etiology MA is usually due to a deficiency of folic acid and/or vitamin B12 or due to leukemia, myelofibrosis, myeloma, hereditary disorders, drugs affecting nucleic acid metabolism–eg, chemotherapeutics–MTX. See Anemia. 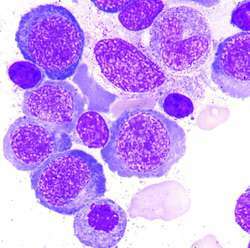 Anemia with a predominant number of megaloblastic erythroblasts and relatively few normoblasts, among hyperplastic erythroid cells in bone marrow. Red cell indices for distinguishing macrocytosis of aplastic anemia and megaloblastic anemia. Vitamin B12 deficiency is well-known to cause pernicious anemia, a megaloblastic anemia in which the red blood cells are abnormally formed, and supplementation may be able to reverse the neurological damage. Folate deficiency has been implicated in numerous medical disorders, ranging from neural tube defects in infants (12,13) to megaloblastic anemia in adults. 12] would start to have signs of anemia, a blood smear would show the enlarged cells characteristic of megaloblastic anemia, and a physician would be on the path to the correct diagnosis. Many nonmalignant disorders mimic the symptoms of MDS, including megaloblastic anemia, parvovirus infection, and autoimmune disease. pylori induced atrophic gastritis leading to cobalamin deficiency and consequent development of megaloblastic anemia. Megaloblastic anemia which occurs due to vitamin B12 and / or folate deficiency, is now a well-recognized and established cause of pancytopenia and there is increased health concern about its consequences world wide19. Folic acid deficiency impairs DNA synthesis and causes megaloblastic anemia. It causes reversible megaloblastic anemia and the most frequent cause of severe vitamin B12 deficiency is the loss of the intrinsic factor in autoimmune atrophic gastritis. Key Words: Pancytopenia, Aplastic Anemia, Megaloblastic Anemia, Leukemia. 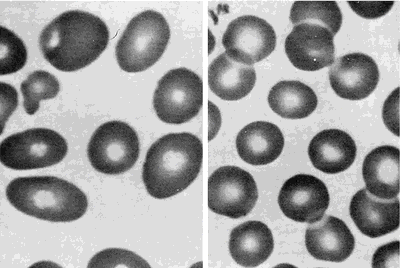 Megaloblastic anemia is characterized by megaloblastic erythropoiesis and is secondary to decreased activity of methionine synthase, one of two mammalian enzymes that requires vitamin B12 (cobalamin) as a cofactor.